How do you hang it? How do you put it on the wall? This is THE number one question we get asked ALL the time about our wall calendars and planners. Yes, they are a little more involved than hanging a simple picture frame. And yes, unfortunately, you do need to mount them into the wall to achieve the floating and frameless look. To help, we’ve made a short video with a few more photos to help illustrate our instructions available on our website here (if using the included wall plugs on a standard plaster wall). We also have some other suggestions if you would like a less permanent option to display your calendars or planners. 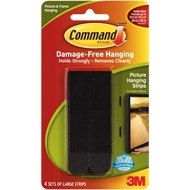 Command picture hanging strips are a bit like velcro strips and a great alternative. They are best suited to our black opaque calendars and planners so you can’t see them through the board. They are available in black, which means they are super discreet. The only downside is your planner will sit flush against the wall rather than floating. Command picture hanging strips can be purchased from Bunnings and most major department stores. Suction sign holders are vinyl suction cups with a wire hook attached. These are typically used to display posters and other signage in windows. These may an alternative if it practical to hang your planner in a window or on some flat fridge surfaces. They are better suited to lightweight applications, so we’d suggest only using these for our small size calendars and planners. We’ve found these at Officeworks. Got some existing shelves or ledge? Display your planner up on a shelf and take down when you need to fill it in or update it. Similarly, you can display your calendar or planner by propping it up on a bench in the kitchen or a desk in your study area. This is a super cool and casual way to have your planner on display, and also means you can move it around instantly if you need to. Have some other suggestions? Please let us know about them in the comments!